Let’s open some radios. Just as medical doctors seek to “do no harm,” you need to use extreme caution each-and-every time you open a vintage radio. As plastic radio cases become brittle with age it is easier and easier to accidentally create heartbreaking scratches, cracks and chips. The workbench is a great place to nick and dent grills as well. A touch from a hot soldering iron will permanently damage any plastic case, so pay attention whenever you bring a radio to your bench. When working on important radios I like to put down a clean kitchen towel as the work surface. Stop working when you get tired or distracted. It’s easy to lose bits and pieces as you work, so have some parts trays handy and get into the habit of using a different parts tray for each radio you have opened at the same time. Remember how things came apart. You’ll be the person putting it back together. Are there any hidden screws to contend with? It’s not unusual, for example for there to be a screw under the tuning dial.Sometimes there are hidden screws that need to be removed. Failing to do so, and then yanking on the case will likely crack it. 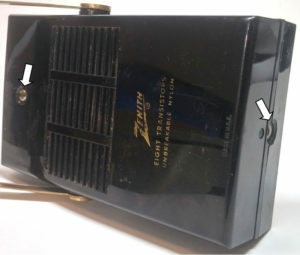 Zenith Royal 500 radios, for example have two outside screws. It's not uncommon for folks to cause damage by failing to notice this. In addition, there might be "hidden" screws that need to be remove when separating the electronics from the case. 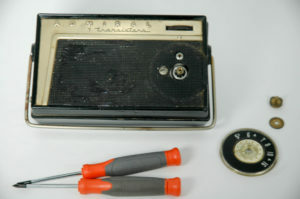 The Motorola radio in the photo on the left is an example. By the way, just because a screw is visible doesn’t mean you should remove it. 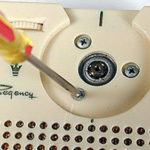 Only one of the three hidden screws in the Regency TR-1 shown on the right should be removed.Look the radio over carefully. Do NOT use coins to open radios. I advise even avoiding screw drivers as pry tools.Many vintage radios require you to pry open all or part of the radio’s plastic case every time you replace batteries. 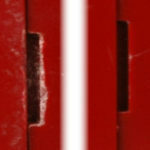 The plastic is often brittle and becomes more so over time. Pristine coin slots add to a radio’s value. Chewed up slots will detract. The radio on the left has coin slot damage while the right one is undamaged. I like the automotive trim removal tools available in auto parts stores and online. They are soft enough to spare the radio. They come in various sizes. Some are more rigid than others. They do wear out but are inexpensive, and easy to replace. 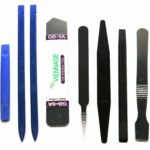 You can also purchase cell phone repair tools like the ones on the right I got from Amazon. They provide many useful options. Take notes as you work. Pay particular attention to the lengths of screws. During reassembly, the use of a long screw where a short screw belongs can cause serious physical or electrical damage. Some hobbyists I know videotape the disassembly process, talking to themselves as they work. This is a great idea, particularly on complex, valuable radios that you are seeing for the first time. Let’s take apart that Admiral find and then look at the components inside. I have damaged more than one radio by enthusiastically ripping it apart in a hurry to make it great again. Slow down. Think. Observe. Remove the tuning dial by unscrewing the big center screw. (Start a parts collection in a small plastic tub now.) Then Remove the two screws on the face under the dial. 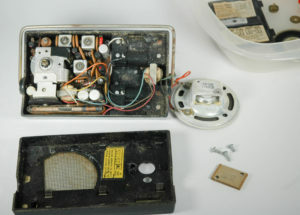 Many times, you can expose a radio’s entire innards by carefully popping off the plastic back. It’s not going to be that easy here. Flip over the radio and remove the battery cover and batteries. Add them to the parts tub. 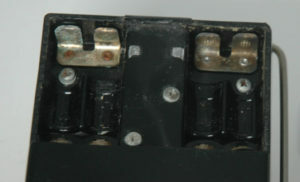 Now remove the four screws in the battery box. Save them. You can see some of the battery contact corrosion we will want to remove. Carefully – very carefully separate the front from the back. The speaker, and perhaps other bits will fall out. Don’t break the wires or lose the parts on the floor. It’s a dirty old radio, but appears to be unmolested. There is a broken-off plastic stud we’ll need to wrangle. Nothing too serious. This radio should be a very satisfying few hour’s work.